The Detroit Lions have been an enigma in the NFL for many years. It is true that the team doesn’t have a playoff win since 1991 & 1 since 1957, & the team can let people down from time to time, but this Lions team is far different than the great offensive teams of the past. They are winning games based on defensive efforts. Let me repeat this……….THE DETROIT LIONS ARE WINNING GAMES WITH DEFENSE. As a Lions fan, I can honestly say that I wouldn’t have guessed that this defense would be ranked #1 in the NFL by the end of week 6, but this is a real defensive effort that the team is putting together & its not a fluke either. 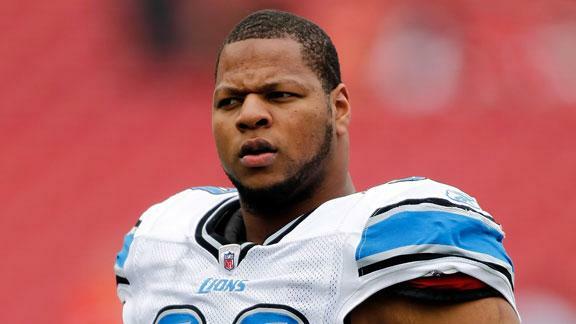 The Lions are able to get great pressure from their front four, led by star defensive tackle, Ndamukong Suh. Suh, who many in Detroit have been annoyed with in the past for his antics & some of the ways he treats the local media, has been every bit of the defensive force that the team felt he would be when he was drafted #2 overall by Detroit in the 2010 NFL Draft. Ndamukong Suh has been an absolute monster on the defensive line for the Detroit Lions, leading the way in stopping the running game & helping get great pressure on quarterbacks through pass rushes. Suh is able to get an amazing amount of pressure up the middle & is a rare breed in that he can play extremely well against both the run & the pass, getting great pass rushes right against the guards & getting great leverage to get to the quarterback. This great effort could be because Suh is in a contract year & there have been reports that Suh may want to leave Detroit after the season for one of the New York teams, but he also has to understand that he has the opportunity to be on one of the truly elite defensive units in all of the NFL. But, Suh hasn’t been the only star on that Lions defense. His defensive tackle partner, Nick Fairley, has been a playmaker, especially since he has gotten his weight issues together & is in full playing shape. The Lions organization refused to extend Fairley’s contract deal this past offseason, which has been seen by many has a sign that it was time for Fairley to prove to the organization that he was worth a first-round pick in 2011, & he has shown that clearly. The heart & core of this Lions team has been their front seven, which many people had expected would be the case going into the season, but even the secondary has stepped up quite a bit. The Lions have been getting turnovers at key points in games, which typically does not happen with this franchise. Yes, I know that the teams they have played and defeated didn’t have an offense that was ranked in the top 10, but you have to beat who is on your schedule, no matter how hard or easy the schedule is because in reality, in the NFL, there are no easy victories against any team. Where do I see the Lions going? I can see where they are a true playoff team. They have shown that they can beat the Packers & even though the Packers aren’t the same offense as they have been in the past, their offensive line is not strong enough to handle the Lions front seven. The Vikings have absolutely no offensive firepower on their team & the Lions just handled their offensive line to the tune of 8 sacks & 3 interceptions. The Bears will be the best offensive unit the team will go against in the division all year & the offensive line is still suspect in Chicago. The Bears have more weapons on offense in the tune of Matt Forte, Alshon Jeffery, Brandon Marshall & quarterback Jay Cutler, but the Bears offensive line is still suspect & the true test of who wins this game will be decided with that defensive line play. Keep your eye out for the Lions on defense. If this unit can keep up their play, this is easily a SuperBowl contender. While you are reading the stories here at the DraftKingsMaster, check out the hottest women in sports category for some of the hottest WAGS in sports right now.